Daily: Today – Monday, Sept. 2, 10 a.m. to 4 p.m.
Bikes will be allowed up the gondola until 4 p.m.
Daily: Today – Monday, Sept. 2, 10 a.m. to 6 p.m., Sunday through Wednesday, 10 a.m. to 9 p.m., Thursday through Saturday. Weekends-only: Sept. 6-8, 13-15, 20-22 and 27-29, 10 a.m. to 6 p.m., Friday through Sunday. Bikes will be allowed up the gondola until 6 p.m.
For more information about Vail Mountain, visit www.vail.com. VAIL — Vail Mountain opens for daily summer operations at 10 a.m. Thursday. 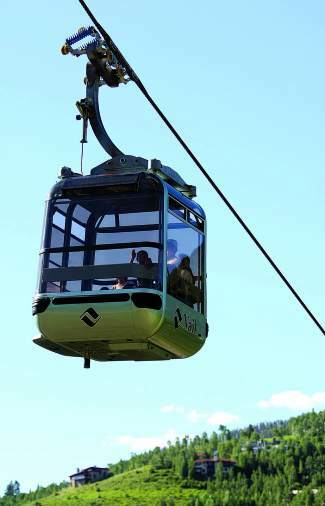 Gondola One in Vail Village and the Eagle Bahn Gondola in Lionshead will both be operating daily through Sept. 2 for scenic rides and bike hauls. The majority of additional summer activities and on-mountain dining will be based out of Eagle’s Nest at Adventure Ridge. The Eagle Bahn Gondola and Adventure Ridge will also continue to operate on weekends throughout the month of September. Open trails today include Berrypicker and Fireweed up to the top of Gondola One for hiking and portions of Hank’s Hideaway, Fred’s Lunch, Lionsdown, Cubs Way, Gitalong Road, Big Mamba and Onza Alley for mountain biking. Guided hiking and biking tours return to Adventure Ridge. The tours offer a great way for guests to enjoy lower level hiking and mountain-biking trails and familiarize themselves with the trail system on the mountain, all with the help of a knowledgeable and friendly guide. Construction continues at Adventure Ridge for Vail’s newest summer activities, which will include a four-line 1,200-foot long zipline, two aerial challenge courses, a kids zipline and a low ropes course. These activities are expected to open to the public in early August. High atop Vail Mountain and just off the top of the Eagle Bahn Gondola, Adventure Ridge offers endless options for summer activities for the entire family, including the Top of the Mountain Tours, horseback tours, disc golf, bungee trampolines, a climbing wall as well as pony rides and Dino Dig for Vail’s youngest visitors. For more information on summer activities at Adventure Ridge and the full FAC summer lineup, visit http://www.vail.com. Situated at the base of the Born Free Express Lift (No. 8) across from the Lionshead ticket office, Gore Creek Mini Golf provides putting fun for all ages on nine par-three holes, open daily from 10 a.m. to 9 p.m.
Refuel while indulging in views of the Vail Valley, Gore Range and Mount of the Holy Cross over lunch at 10,350 feet on Talon’s Deck at Eagle’s Nest open daily. Mid-Vail will also offer lunch daily at Sarge’s from 11 a.m. to 4 p.m. Bistro Fourteen also opens today and will operate on Thursdays, 5–8:30 p.m.; Fridays and Saturdays, 11 a.m.–8:30 p.m.; and Sundays, 11 a.m.–5 p.m.
Game Creek Restaurant opens for Sunday brunch on Sunday at 11 a.m. Dinner service begins today from 5:30 to 8:30 p.m. through Sunday, Sept. 2. Regular summer hours for dinner will include Thursdays, Fridays and Saturdays with apres specials on the deck from 5:30 to 7 p.m. and brunch on Sundays from 11 a.m. to 2 p.m. Lift tickets are required to ride Gondola One and the Eagle Bahn Gondola during the summer and can be purchased at the Vail Village or Lionshead ticket offices. Season pass holders for 2013-14 receive free scenic access to both gondolas. Guests who have not yet secured a pass for next winter can purchase online at http://www.epicpass.com.